July 7, 2016, 11:06 a.m. The Tour is only 100km longer than the Giro this year. This is over the same number of 21 stages. The Giro is not quite there yet, but look at the flat stages (none exceeded 200 km) versus the Tour (three stages over 200 km). The contrast is even starker when comparing the Vuelta flat stages. July 9, 2016, 10:22 a.m. 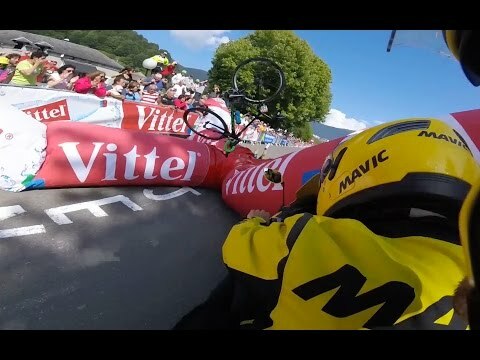 So what's the rule when la flamme rouge collapses and causes a crash? July 10, 2016, 7:34 a.m.
[INDENT]In the event that a rider or riders suffer a fall, puncture or mechanical incident in the last 3 kilometres and such an incident is duly recognised, the rider or riders involved are credited with the same finishing time of the rider or riders they were with at the time of the incident. July 10, 2016, 12:25 p.m. 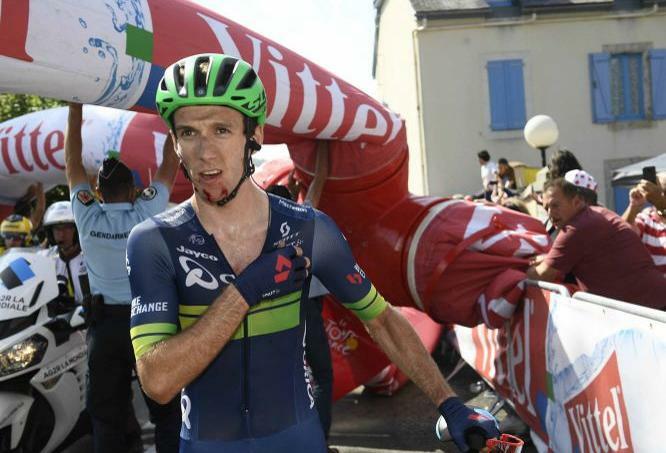 It's a pretty awesome crash for Yates. He probably would have ended up with yellow yesterday if not for that, even with Froome's downhill attack. July 11, 2016, 9:19 a.m. Apparently the race jury decided he was 7 seconds ahead of the peloton, so they gave him the same 7 second advantage as his finish time, keeping him in white. July 11, 2016, 3:43 p.m.
Thankfully he didnt face the motorbike behind him. July 11, 2016, 3:47 p.m.
Orica is racking up the Tour stage finishing issues. A couple years back they got their team bus stuck under the finish line banner and now the 1km marker falls on a rider. July 11, 2016, 8:18 p.m.
Nairo Quintana has got to be the most passive GC contender of the modern tour. All he does is stare at Froomes' backside. He better grow a pair and try something proactive if he wants something other than the status quo. Waiting for Froome to crack doesn't seem to be paying dividends. July 11, 2016, 9:14 p.m. Sorry, couldn't let that go by. Yeah, he's obviously got the legs to hang with Froome, and he even had a teammate with him yesterday right to the end. They must have a plan of some sort. I'm liking Dan Martin as a wild card to mix things up a bit. July 12, 2016, 7:06 a.m. I keep asking myself the same thing. All the riders look like they missed arm and shoulder day at the gym. July 12, 2016, 8:49 a.m. There has barely been any mountain stages yet and all everyone can talk about with Quintana is that he hasn't attacked. My guess is that he's saving it for the bigger steeper stages in the Alps. Good to see Bling edge out Sagan this morning. July 13, 2016, 11:38 a.m.
Today is why I like Sagan so much. He has. Honoured the WC jersey like no one in recent memory. And respect for Froome too. I'm thinking maybe Sky has been controlling him too much for all this time and now it's him racing. July 13, 2016, 1:08 p.m.
Today's last 15 or so km is some of the most entertaining racing I've seen in a LONG time. Just good old fashion bike racing… It's hard not to like a guy like Sagan. The guy just legitimately likes riding bikes. July 13, 2016, 1:37 p.m.